PI313. 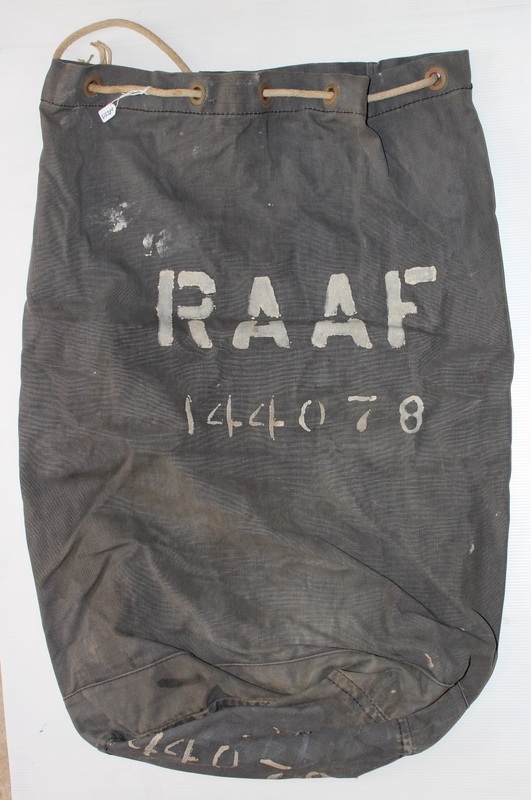 A blue kit bag stencilled in white RAAF 144078. Ian Neilson Lamb enlisted on 18 Aug 1943 at Melbourne and discharged with the rank of Aircraftman 1 on 21 Jul 1944 from 54 Radar Station. PI318. 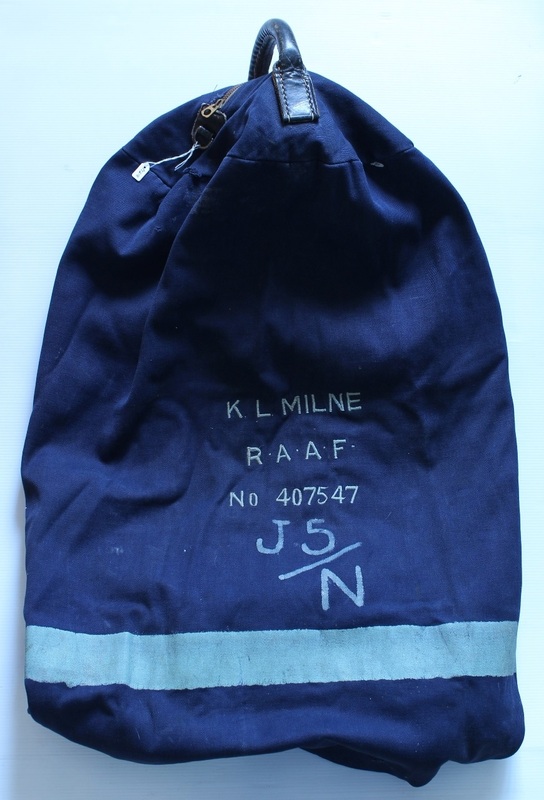 A blue kit bag embroidered in light blue “RAAF No 407547”. Kenneth Lancelot Milne enlisted on 9 Nov 1940 at Adelaide and discharged with the rank of Flight Lieutenant on 25 Oct 1945 from 3 Air Observer School. This bag has a padded leather handle and is closed by a zipper. PI322. 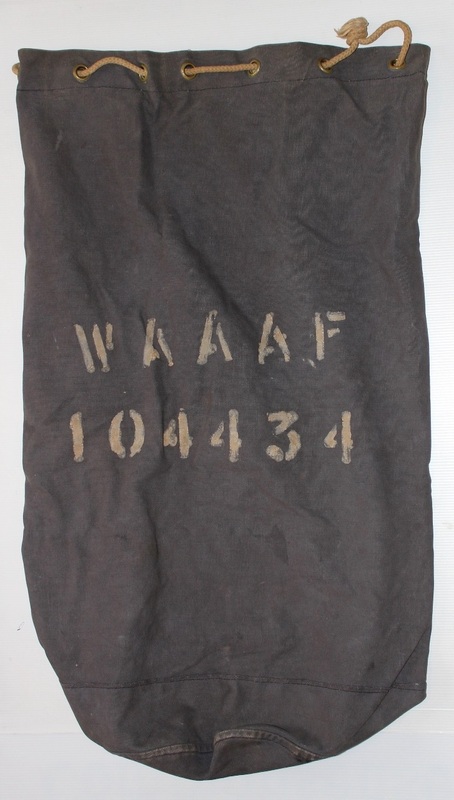 A black kit bag stencilled in white “WAAAF 104434”. Joan Swanborough enlisted on 16 Sep 1942 at Melbourne and discharged with the rank of Aircraftwoman on 27 Nov 1945 from 1 Personnel Depot (STAFF). PI325. 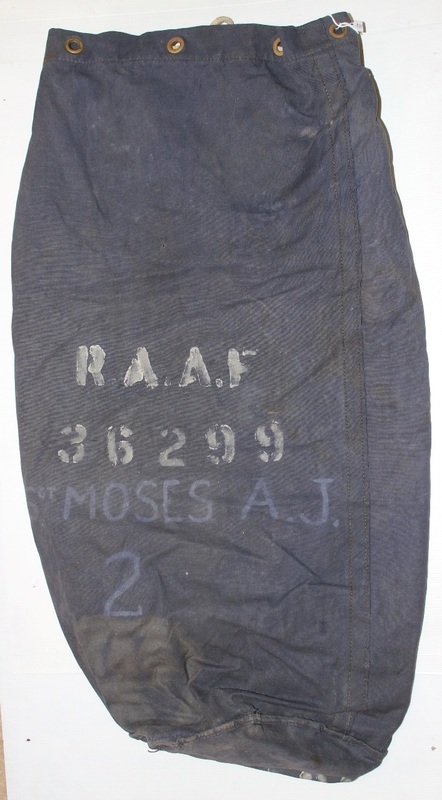 A black kit bag stencilled in white “RAAF 36299 MOSES A. J.” Albert Jenkinson Moses enlisted on 29 Apr 1941 at Sydney and discharged with the rank of Sergeant 19 Feb 1946 from 9 Aircrew Holding Unit. PI328. 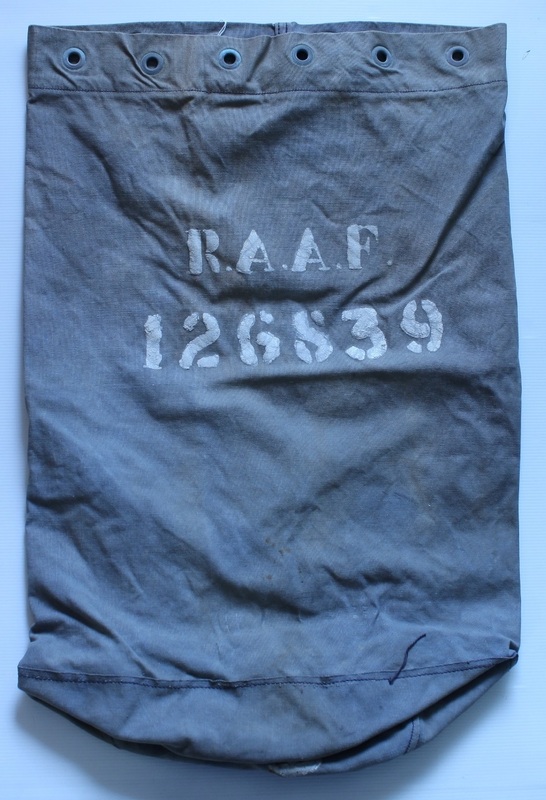 A very faded blue kit bag stencilled in white on the side and base RAAF 126839. Daniel Andrew O’Donohue enlisted on 11 Feb 1943 at Melbourne and discharged with the rank of Corporal on 5 Feb 21946 from 37 Operational Base Unit. PI337. 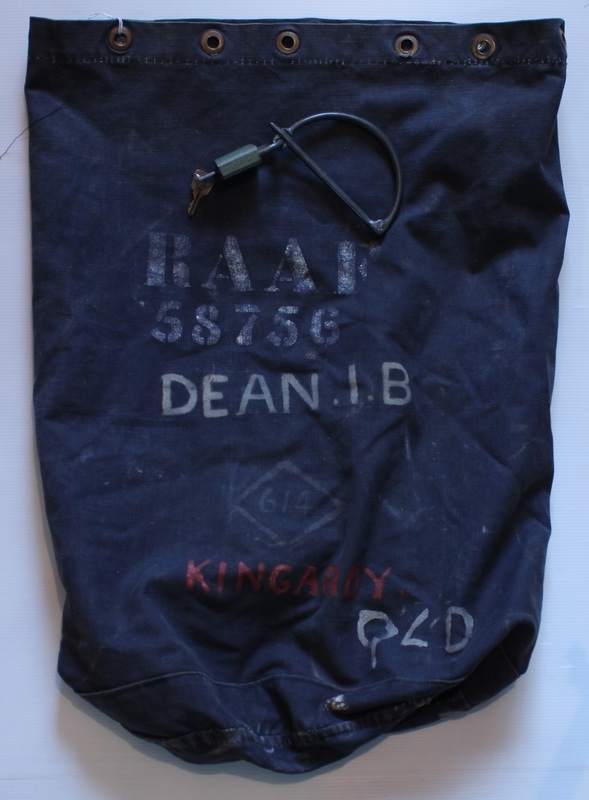 A black kit bag stencilled in white on the side and base RAAF 58756 DEAN. I. B and 614 in a diamond and KINGAROY in red and QLD in white, complete with D handle and padlock. Irwin Barrett Dean enlisted on 6 July 1942 at Melbourne and discharged with the rank of Corporal on 5 Jan 1946 from 7 Operational Training Unit Tocumwal NSW. PI344. 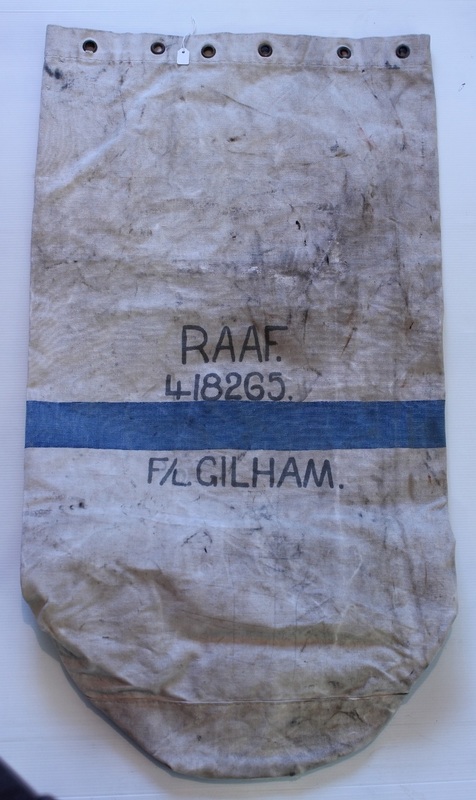 A white kit bag with a blue stripe stencilled in black RAAF 418265 F/L GILHAM. Norman Albert Charles Gilham enlisted on 15 May 1942 at Melbourne and discharged with the rank of Flight Lieutenant on 25 Jan 1946 from HQMAAF. Believed to be Headquarters Mediterranean Allied Air Forces. PI346. 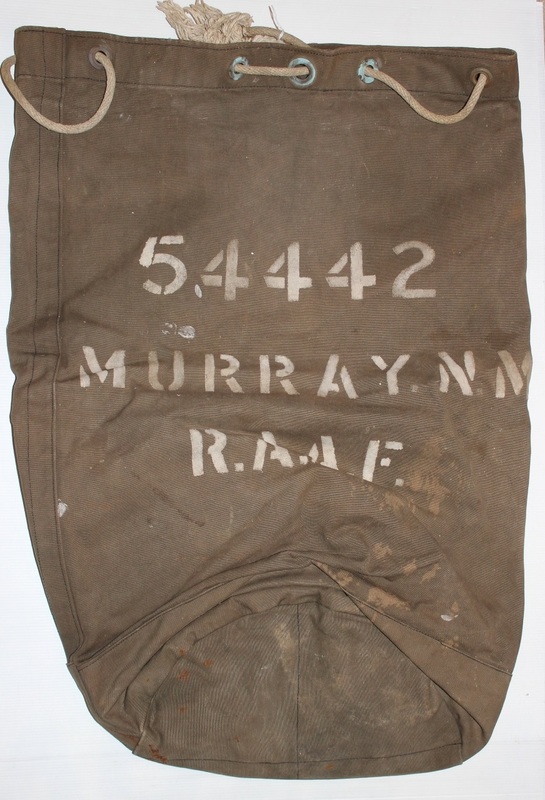 A grey/green kit bag stencilled in white 54442 MURRAY N. M. RAAF. Norman Maxwell Murray enlisted on 21 Apr 1942 at Melbourne and discharged with the rank of Corporal on 6 Feb 1946 from the Air and Ground Radio School at Ballarat. PI349. 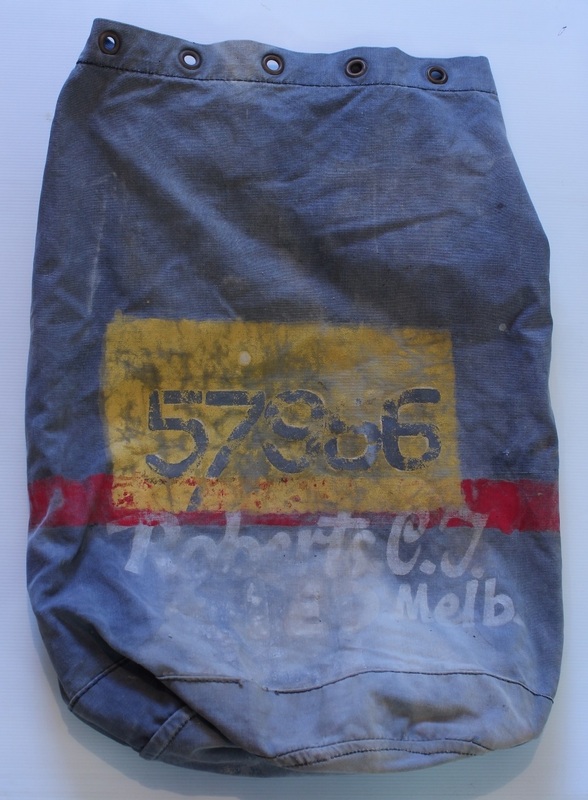 A faded blue kit bag stencilled in yellow and red 57966 Roberts C. T. Charles Thomas Roberts enlisted on 22 Jun 1942 at Melbourne and discharged with the rank of Corporal on 6 Mar 1946 from 2 Squadron. PI350. 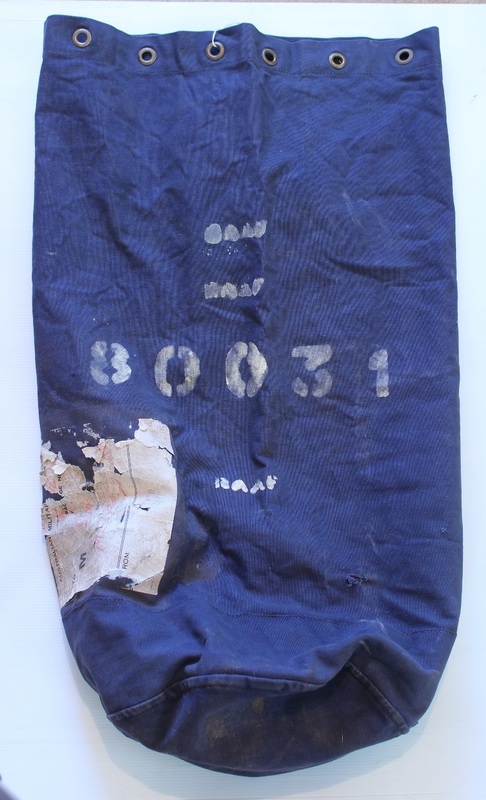 A dark blue kit bag stencilled in white 80031 RAAF. Alan Foxton enlisted on 31 Mar 1942 at Perth and discharged with the rank of Leading Aircraftsman on 18 Dec 1945 from 4 Aircraft Depot. 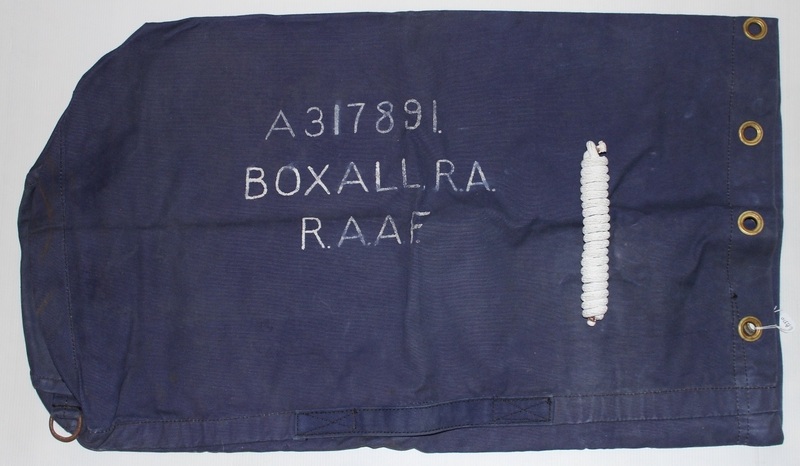 A blue canvas kit bag marked in white A317891 BOXALL R. A. RAAF with rope inside.